I’ve decided that I’m going to completely redo this list every 6 months (it’s about 6 months since I last made it), just because I play a lot of games and my tastes are always evolving. Here’s the previous list. I’ve excluded the games I’ve designed and/or published from this list. This list is geared towards the games I am most excited to play right now. As in, if you called me right now and said, “Jamey, let’s play _____,” these are the games for which I would probably say yes. Close consideration went to Imperial Assault, Risk Legacy, Mysterium, Tribune, and Ticket to Ride. Orleans probably should be higher on my list, but I’ve only played it once, so I don’t feel like it’s fair to rank it any higher. 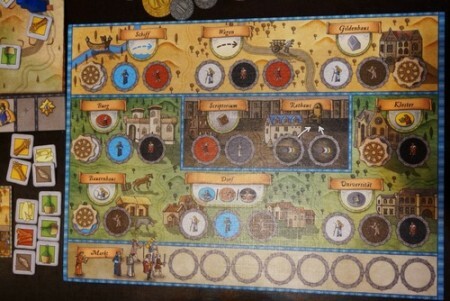 That’s right–Orleans hasn’t even been released in the US yet. I played a German version at a convention in May, and I’ve been thinking about it ever since. It’s largely an engine-building game, and I love engine-building games. 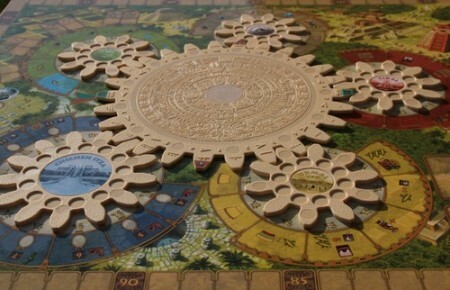 Thanks to its innovative dial system, the simplicity of turns, and the myriad of interesting choices, Tzolk’in has been on this list since I started making Top 10 lists. The only reason it’s dropped is that I’m always a little less excited to play games where I have to feed my workers. They should feed themselves! Okay, so I don’t always want to play Telestrations. It’s a jovial social game, in stark contrast to the many Euro strategy games on this list. But I always have so much fun when we end up playing Telestrations, especially in big groups. 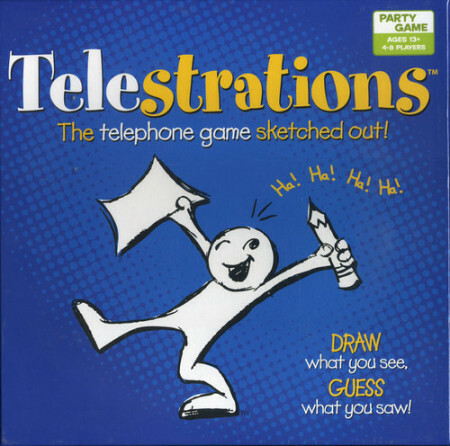 I love that unlike other social games, you’re never in the spotlight when you play Telestrations–it’s actually a fairly private social game. But the laughter that ensues is shared by all. Every time I make this list, I keep hoping that a cooperative game will upend Forbidden Desert. 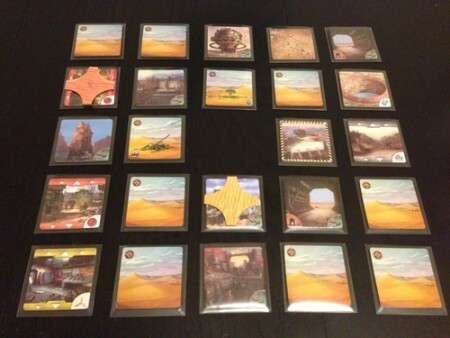 I’ve played lots of very high quality cooperative games: Hanabi, Pandemic Legacy, Robinson Crusoe, Battlestar Galactica, Dead of Winter, Shadows Over Camelot…yet I’d choose Forbidden Desert over any of them, even though it could be objectively argued that those other games are “better.” I just like this one more. It’s full of interesting choices and I love how the tiles move around and accumulate sand, keeping each game fresh. Whenever I make this list, I look at my shelf and my BoardGameGeek ratings. I ask myself, “What would I gladly play right now?” Blokus never fails to stand out as an absolute “yes” when I ask that question. It’s completely bereft of theme, but it’s so simple yet packed with interesting decisions. My brain is happy when it’s playing Blokus. 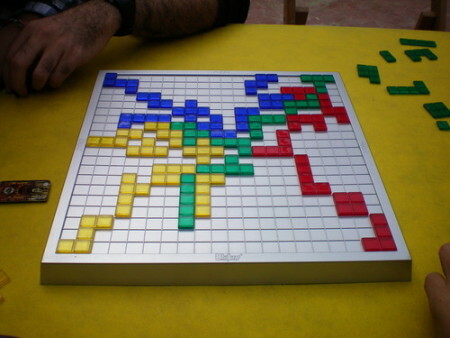 Kemet is the one game on the list where you are directly fighting other players. I have much less of a problem with that than I used to (Blood Rage is a great recent example of that), and I credit Kemet to opening my eyes to great games with direct conflict. Combat is so fun in Kemet because it’s not random, it’s not spiteful, and it’s easy to bounce back when you lose. This is one of three newcomers to the list (Orleans and Patchwork are the others). 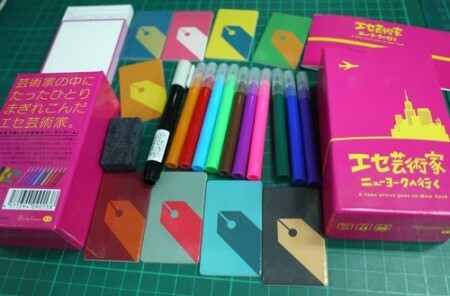 It has a delightful premise: All players are artists collaborating on the same illustration. All players know exactly what they’re drawing…except for one player. It’s your job to figure out who that player–the “fake artist”–is. It’s such a clever concept that can result in some truly hilarious moments. I don’t play many strictly 2-player games, but one of the guys in my gaming group shared a bunch of great 2-player games a few months ago. 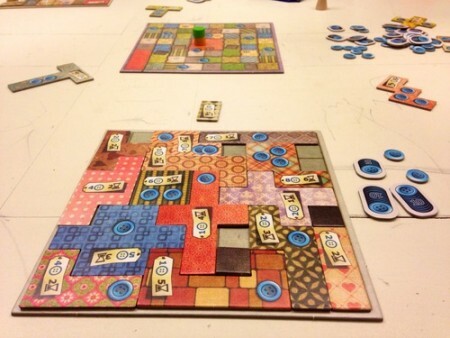 For me, Patchwork was the standout of the group (among them also were Lost Cities, Jaipur, and Hive). It’s a game about making a quilt by fitting together Tetris-like pieces, each with a cost of some time and some buttons. You’re trying to complete the quilt by leaving as few holes as possible. It’s super easy to learn and is full of interesting choices. This will probably be my Christmas present to everyone I know. Now we get to the big guns. Terra Mystica was my previous #1, and on any given day it probably still could be up there. I think the only reason it dropped–despite how much I love it–is that I would choose to play the new #1 game over this one right now. Terra Mystica still remains a fantastic, deep engine-building game. 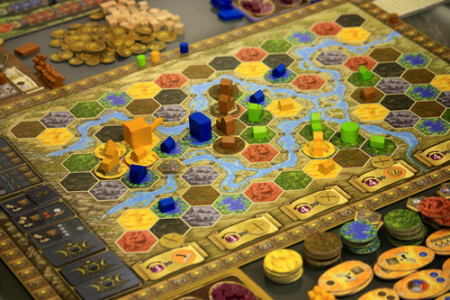 When you play Scythe, you’ll see the huge impact Terra Mystica had on it. We have a new king, and his name is Ludwig. 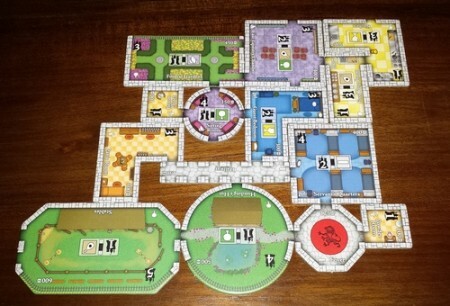 This is a game about building a castle, which is awesome, because I love castles. But more importantly, it’s one of the best examples of a rewarding game that I’ve ever seen–everything you do rewards you once or even several times. I like to feel rewarded when I play games. I actually played with all three expansion modules for the first time the other day, and that almost knocked it down a few notches, because it was a little too much to add all at once. But that was my fault, not the game’s. I can’t wait to play again with only 1 or 2 of the expansion modules (probably swans and secret passages). While it looks like there’s a lot going on in this game, it’s actually quite streamlined and easy to learn, and you can play it in 60-75 minutes at most. It’s a delightful game, and I’d recommend it to anyone. Are any of these games on your Top 10 list? This entry was posted on Tuesday, November 10th, 2015 at 10:48 pm	and is filed under favorites and tagged with board game, favorites. You can follow any responses to this entry through the RSS 2.0 feed. Thanks for sharing, Julia! I want to try Isle of Skye and New York 1901. Some of these can change because as you just said, tastes evolve, but I will always enjoying playing them anyway. Awesome list! I have Arboretum but haven’t tried it yet–sounds like I need to do so! 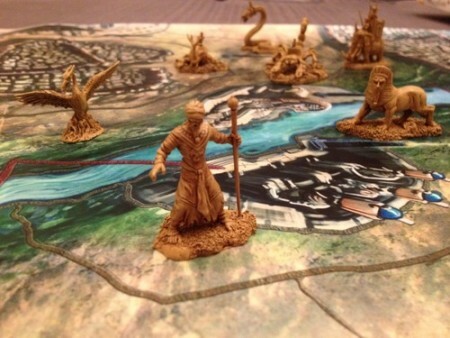 Indeed, I have played Cthulhu Wars! I enjoyed it, though it’s the legacy aspect of Risk Legacy that really hooked me, and CW doesn’t have that.